RUN RUN RUN. That’s what twelve-year-old Annie loves to do. When she’s barefoot and running, she can hear her heart beating…thump-THUMP, thump-THUMP. It’s a rhythm that makes sense in a year when everything’s shifting: Her mother is pregnant, her grandfather is forgetful, and her best friend, Max, is always moody. Everything changes over time, just like the apple Annie’s been assigned to draw a hundred times. 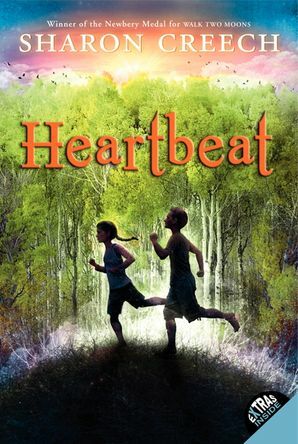 Newbery Medal winner Sharon Creech masterfully weaves this tender and intuitive story told in free verse about a young girl beginning to understand the many rhythms of life, and how she fits within them. When I learned that my daughter was expecting her first child, I wondered what it would be like to be a grandparent, and out of those wonderings came Granny Torrelli Makes Soup. After I finished that book, and after my granddaughter was born, I continued the exploration of grandparents—and a new baby in Heartbeat. As I was writing this book, I felt as if I were taking the pulse of this young girl, Annie, who is trying to place herself on this spectrum of life. Where does she fit in? She wonders what it would be like to be old, and what it would be like to be an infant, and how she became who she is, and who exactly is she, and why is she here? These are questions I had when I was Annie’s age, when my grandparents were aging, and when my mother was expecting my youngest brother. I felt as if I was balancing on the cusp of some important life thread, and it was essential to try to understand where I was, in the larger scheme of things. Annie’s art teacher gives an assignment to draw one apple a hundred times. My daughter was given this assignment in school. She said she learned more about drawing from that one assignment than from anything else! Like Annie, I used to run for the pure pleasure of running. It made me feel free, and it calmed my mind. I no longer run very much, but I take long walks, and it is often during these walks that an idea for a scene or a whole book will arise.